I don’t know why we’d not yet made it all the way to the top of The Shard before. I’ve celebrated an anniversary in one of the restaurants, but the View from The Shard has been on my To Do list since, well, forever. So, when my daughter, Lucy, and I were offered tickets to the Halloween event, we jumped at the chance. Early starts don’t faze us, (lucky us! ), even so, I loved being able to step out of the concourse at London Bridge station straight onto the Shard’s front entrance. We joined a queue of cute kids in spooky hats, dresses and cloaks waiting to get inside, then followed airport-style security to the lifts. We could feel the excitement levels building as everyone shuffled along the corridor. But then this is an award-winning attraction – one of the top five tallest buildings in Europe, the highest in Western Europe – and very soon we were all going to be more than 300m high! The lifts travel at 6 metres per second, counting off the floors, views from the top (in all seasons) flashing on the ceiling, taking just 30 seconds to reach floor 33. We swapped lifts for the second leg; this time one of the staff jumped in for a ride to work (telling visitors about the view – nice job!) landing at level 68. 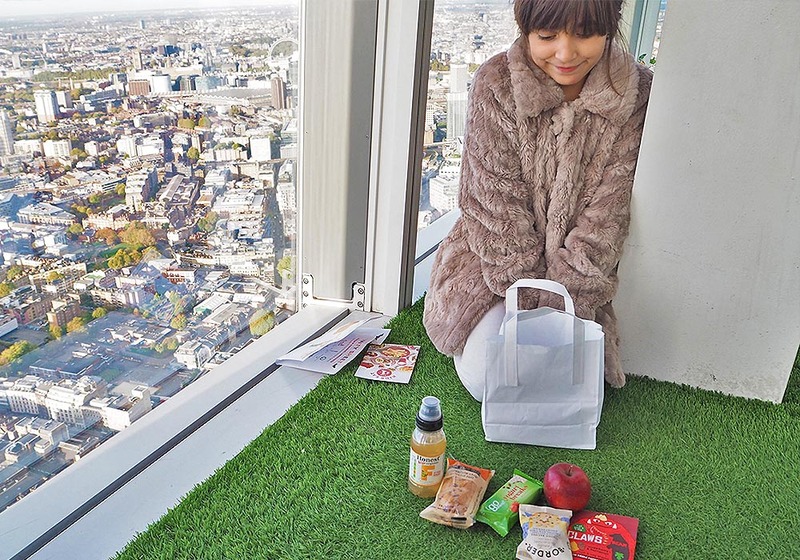 Breakfast bags were thrust into our hands with a cheery greeting then we were waved to stairs leading to level 69. Youngsters sat in huddles around the glass wall perimeter, hungrily opening their breakfast bags. Lucy and I were keen to go up the highest accessible level, as far as humans can humanly go… Level 72! No-one else was up there (probably because free, fresh coffees were being served downstairs – what a nice touch!). Level 72 is exposed to the elements, but it was designed (by Italian architect Renzo Piano) to fend off gusts of wind, so you barely feel the breeze. Blessed with a fine, crisp autumnal day, the skies were blue and the views… eye-popping! London looked beautiful from every angle of the 360° skyscraper: north, south, east and west. The Thames glistened in the sun. Sightlines stretched for miles and the rooftops… Ok, so as anyone who’s been on the London Eye will know, the city’s rooftops are not much to shout about. “London’s buildings look old-fashioned and quite plain,” Lucy said. “That’s rooftops for you,” I replied. Tower Bridge stood out as the striking wonder it is, The engineering marvel took 12 years to build between 1888-1894, and 22,000 litres of blue paint were used to paint it, and gosh, it looks gorgeous from up here. Next time we’ll bring our sketchbooks! The aerial view of HMS Belfast is also impressive. As a World War 2, D-Day, Royal Navy survivor she is worthy of a good few minutes of respectful admiration – if you want somewhere to go after, I suggest there. From here, the river snakes its way toward the Dome at Greenwich, passing the London Eye, Big Ben (although the Elizabeth Tower will be encased in scaffolding until 2021) and Shakespeare’s Globe – all sights that a 9-year-old recognises. I nostalgically studied the green areas of south London where I first lived, until we spied Wembley Stadium, which delighted Lucy, who then looked long and hard for other landmarks near our NW home. After a while, chilly fingers forced us back down to enclosed Level 69. It was time for us to snack while crowd – and cloud – watching. (Lucy has a gift for turning clouds into animals and objects, it has to be said, so this was fun). It looked like all the kids were really enjoying today’s event; two face-painters were turning their angelic faces into little devils and vampires. Activity Sheets – included in the goody bag – were being pressed against the glass and busily filled in. “If you were to design and make your own Shard, what would you make it from and why?” Ice cream! We heard a girl exclaim. There was ice cream on sale, maybe that’s what she had meant? It’s never too early for ice cream, is it? But we’d had plenty to eat (thumbs up for the snacks). 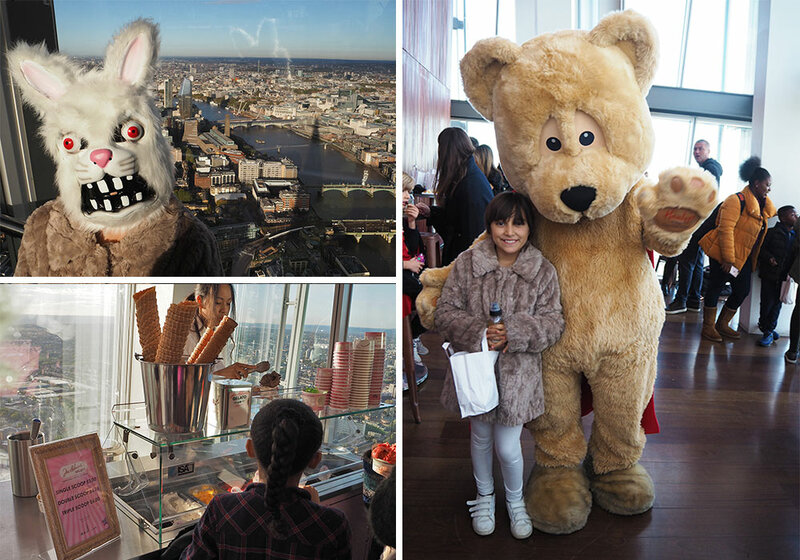 We gave the Hamley’s life-size teddy a quick cuddle then checked out the ‘loo with the view’ – a floor-to-ceiling vista over The Tower of London. 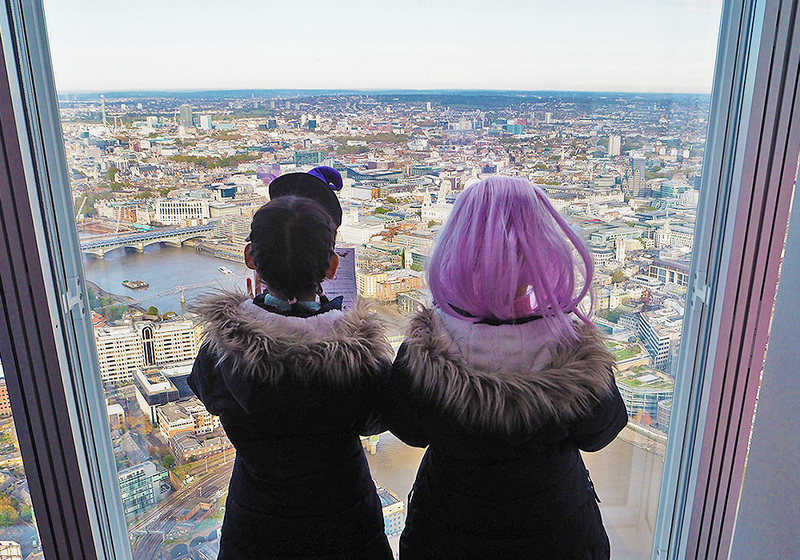 Looking down on mind-blowing, ancient history from a lav that’s almost twice as high as any other viewing platform in the capital is quite a trip. A group of older girls accompanying our descent said that the experience had been “BRILLIANT!” Lucy said how exciting it had been to see so many landmarks from one place. And a friend we’d bumped into said her kids had really loved dressing up in Halloween outfits for the event. Would we go back, Yes! Will you love it too? Of course. I can’t wait to return this Christmas. 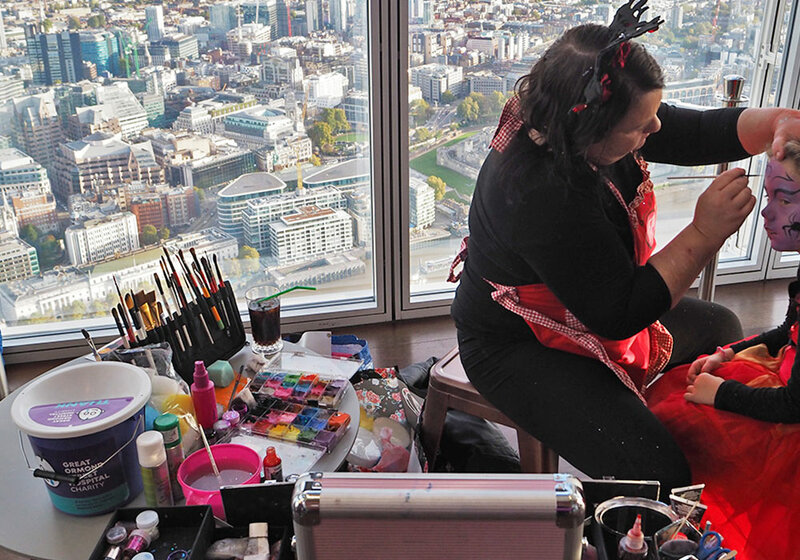 Fancy coming to our exclusive Christmas event at the Shard? Pop over to the LittleBird website and purchase your tickets, they’re sure to be a sell out!